Get up close with our elephant family by spending a day in the life of a mahout (elephant caretaker)! Escape the crowds and Spend time getting to know elephants with this unique adventure - 1 person per elephant. This experience is an excellent introduction to elephants where you will learn to care for them, bathe them in the river and walk with them through the jungle to forage for fresh healthy food. Spend a day with beautiful Asian elephants and learn how to be an elephant caretaker. Learn about their history in Thailand and how your purchase of an elephant experience with our organization helps to create a safe and permanent home for them. Get to know the elephants, learn how to approach them and feed them fruit and sugar cane. Learn how to feed, approach, and communicate with elephants. Relax at the riverside cafe and enjoy delicious local foods. 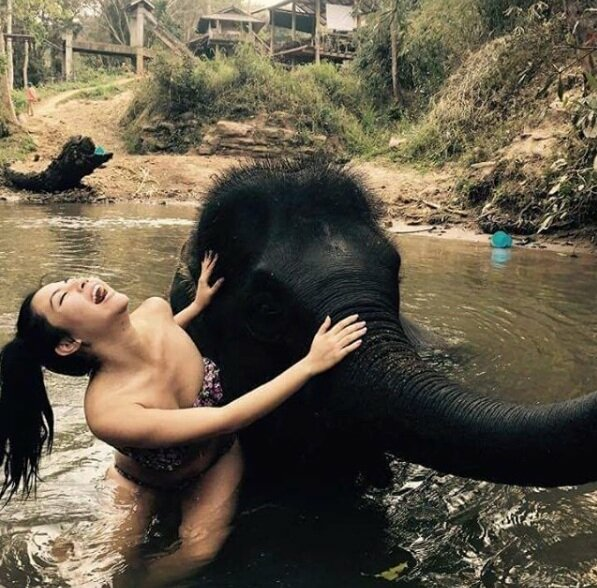 After lunch, wash and swim with a baby elephant in the river. You will also get to experience bamboo rafting (approximately 1 hour) down the Mae Wang river nestled in a valley surrounded by mountains. Thanks for your interest in booking with the Chai Lai Orchid! How did you hear about this adventure? Please enter the name and phone number of the hotel you'd like to be picked up from. If you don't yet know, you can tell us at a later date by email. Please enter an email address for future communication. Want to live WITH ELEPHANTS? We also offer 2-3 day trips where you can stay with elephants in the jungle. Click here to learn more.